I owe a big shootout to my lovely bridesmaids. They hosted showers, traveled many miles, partied down at my bachelorette party, purchased gifts, gave heartfelt toasts, saved the day by convincing the venue coordinator to let us use the sky lanterns last minute, and were just the best friends any gal could have. 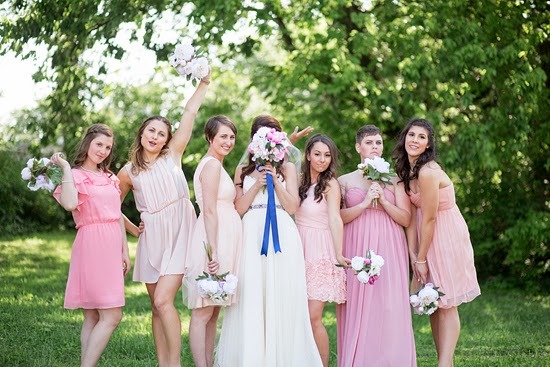 Oh and they did a super swell job of taking my annoyingly vague dress shopping directions of "blush chiffon", to create the best mixed bridesmaid dress roundup I've ever seen! 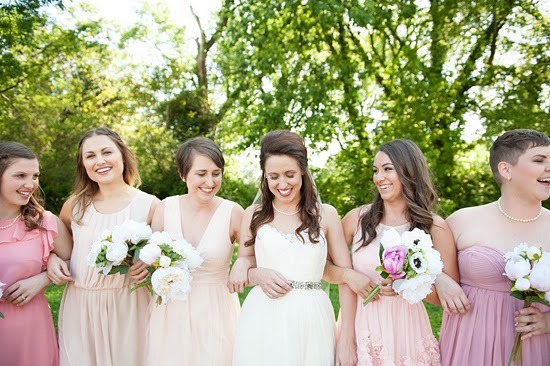 Tips for making your best friends happy during your engagement, wedding planning & big day? 1. Be upfront about your expectations. When you ask your ladies to be a part of your day, include the activities/costs that you expect as their duties. 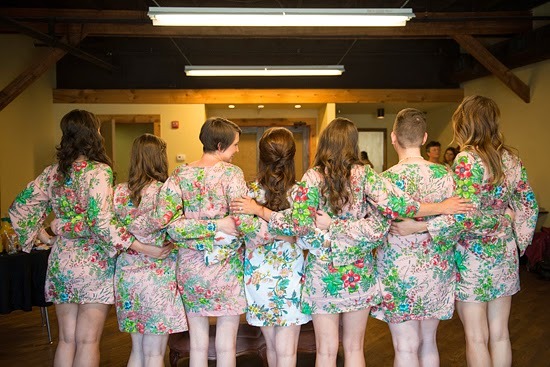 Having a destination wedding, with a destination bachelorette party and dreams of your bridesmaids footing the bill for their Vera Wang dresses… it's only nice that you tell them that! 2. And then stick to what you said. If you say, "I don't need you at my shower" & then get super hurt that they don't show up, that is poor communication. You still want to be friends after the wedding day! 3. Give them clear directions & then let them actually do their assigned jobs without you micromanaging. They are not only your closest friends that know you better than anyone else, they are also totally capable adults. 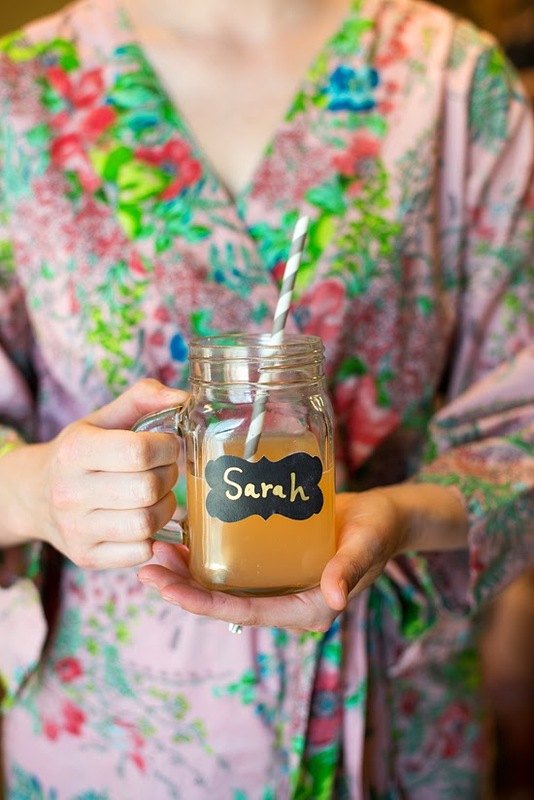 Don't lose sight of this during the wedding planning craze. 4. Treat them right - say thank you, get them a token of your appreciation (I went with pretty robes to get ready in on the Big Day), remember to ask about their lives, go out for lady dates, don't forget to be a good friend back. 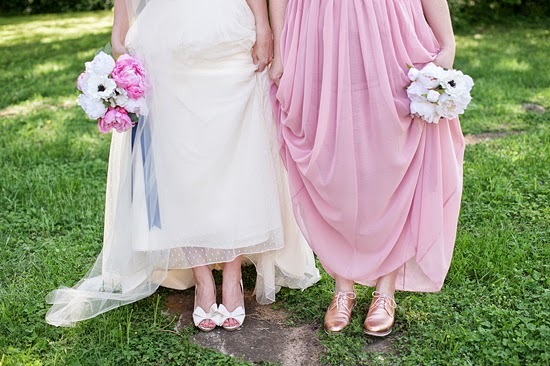 Any Bridesmaids horror stories or tips you have learned as either the bride or bridesmaid? Very good tips! I don't have a horror story but have seen other weddings where the bridesmaid would give horrible attitude towards the bride. Making her cry because something didn't go the way the bridesmaid thought it should go. Not good. Ohhh I have a maid of honor horror story. You hear about bridezillas - she was a MOHzilla. It looks like you had none of that which is awesome! 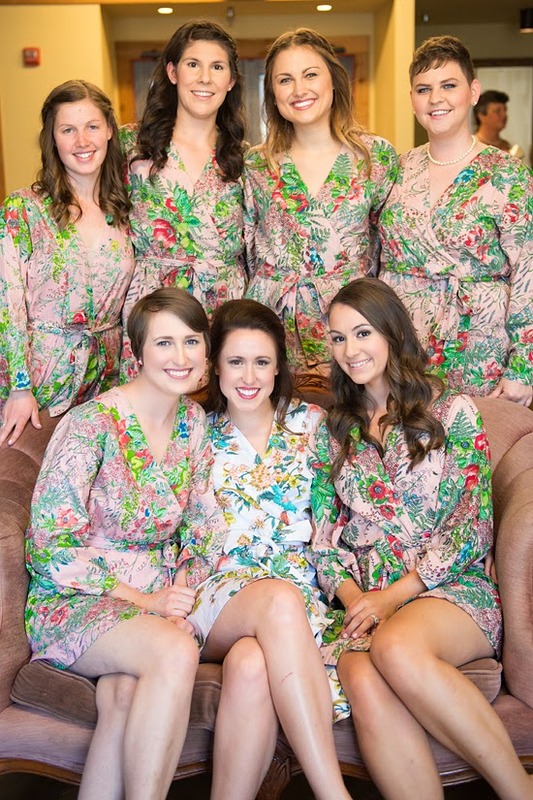 You and your bridesmaids all look so beautiful and so happy! Everyone looked great! I mentioned it on yesterday's post but I still kick myself that I didn't do something like this for my girls' dresses. I wish I would have let them pick something they liked and would actually wear again. Hindsight right? My horror story was that 5 months after our wedding I had a huge falling out with one of my bridesmaids (the one who sucked at doing my makeup, also mentioned in my comment yesterday). We never talked again after that and I would get so pissed whenever I looked at my wedding pictures because she was in them. My hair stylist actually gave me the greatest solution though...cut out a little square from the sticky part of a post-it and put it over her face so that you don't have to look at it. That way, it doesn't ruin the whole aesthetic of the picture but prevents you from looking at her face & getting pissed. So for several years all of the wedding photos we had up in our house had a tiny little post it over her face. Every time I looked at them I would still enjoy the beautiful picture and then have a little chuckle about the tiny square. PS - LOVE the robe gift idea! AWWW everything turned out SO gorgeous! I love how the dresses went so well together and LOVING your hair Jess... it is so simple and pretty! Everything went smoothly with the two weddings I was in last year... and just purchased a bridesmaid dress for a wedding I'm in next summer. I think being openly honest about your expectations is most important. I didn't realize how much I would be spending on a dress when we were told we could pick out our own (which is what we did for my older sister's wedding... I chose where from, what style, just needed to be a shade of navy). What the bride to be really meant is you can pick out your own STYLE but at the store and in the color and fabric she wanted and needing to purchase it on the specific day we went shopping. I was a little disappointed just because I didn't love any of the dresses and hadn't budgeted that much so soon for a dress because I thought we were just looking to get ideas and start to see which styles we like. So thinking ahead, I will definitely be communicating a lot with my bridesmaids! Feed them the day of the wedding! I was in a wedding where there were only bagels in the morning and nothing else provided until the cocktail hour at 6:30. I was starving! Omg. I've been waiting on your wedding posts! You look so beautiful and the dresses are all so pretty! your wedding is picture perfect! 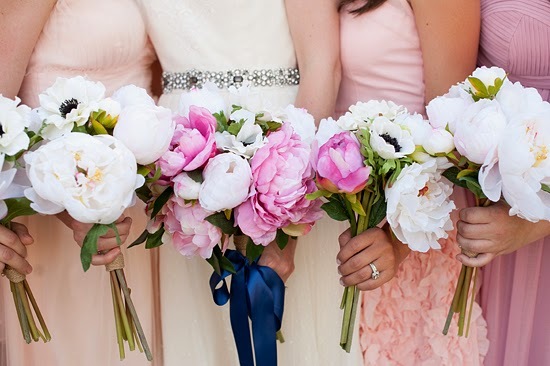 these photos are beautiful and i love the blush color! How adorable :) Everyone looks gorgeous! Those robes area adorable, love it! Those are great tips! I know of a few people who are no longer friends with some of the girls they had in their wedding and that is not something you want to think of when you look back at your wedding photos. Every bride should read these tips! I love the robes you got for your girls! Such a great gift! 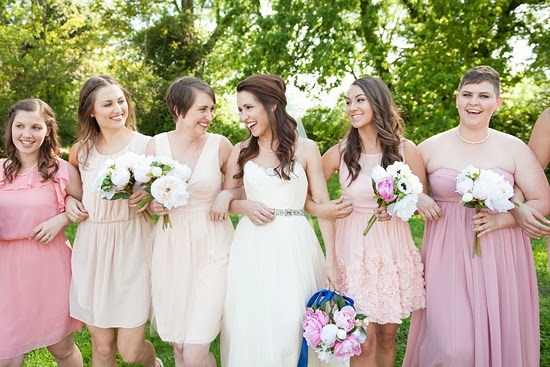 You and your bridesmaids look absolutely gorgeous! Your paint chips were especially helpful in dress color selection-- you forgot that part! I gotta say, we did look great, and I had a blast! I loooove all of the dresses they picked out! They all came together perfectly...like to the point that ya'll should go viral on Pinterest! I love the robe idea, so adorable! I love the robes you gave your girls - a cute and useful gift! !